New Technology is going to shape the entire value chain. The transition to digital has been well underway for many years now. While some industries are well down the road, others are just getting started and this is creating exceptional revenue growth opportunities for leaders in their field. The transition to digital printing on textiles for garments and apparel, household goods, and industrial textiles is poised to change relationships to customers and how products are brought to market. Faster, easier, design with better editing and visualization capabilities. Faster, more accurate patterning making, with greater design options. Faster, manufacturing production, with lower inventory, and shorter production runs. Shortened supply chain, and faster response to customer orders and requests. The transition to digital dye sublimation printing is being driven by consumer and retailer demands for rapid customization. Dye Sublimation printers are to garments and apparel what 3D printers are to solid goods - both categories are on fire. Dye Sublimation is projected to grow at 18% per year for the next 5 years. Garments and apparels are the primary use representing approximately 75% of the market. Currently only about 2% of textiles are produced digitally, indicating large upside potential. 2D CAD is still in widespread use in the fashion and apparel markets. However the high growth in Digital Printing will put pressure on the upstream technologies in the workflow. Right now there is no leader in 3D CAD for apparel and textiles. However, he who moves first and fast will reap the lion's share of the benefits. While 3D CAD tools are advanced and mature in industrial markets, more can be done to meet the demands of the “Fast Fashion” segments. In our experience, 3D CAD with organic modelling capabilities already meet much of the demands and are already in use, however any of the major 3D CAD providers are highly capable. The bottom line is, in our opinion, there are going to be clear winners and losers in this segment since customers tend to stay with initial choices. Some of these components will vary very little and almost be locked. Other aspects will allow for a much wider spectrum of changes. The final result will be products with degrees of configurability, but the overall collection will appear virtually endless and that is very good for customer choice and sales. Leading companies and early adopters are figuring out this workflow now and those who get it right are poised to capture the customer. Manufacturers are in a race to add features and win customers. Many are projecting to double their revenues over the next 5 years. With the prospects of this kind of change, there are healthy investments in R&D, sales and marketing to set up winning conditions. However, there is a major strategic question on the table: How much of the value chain/workflow do they need to include in their offerings? We can take examples from the CNC cutting table industry. It is on these tables that the majority of textiles are cut. For these companies, they have chosen to integrate upstream value chain/workflow tools into their cutting table offerings. This has been the case for decades now already. In fact, the upstream software can be a more significant aspect in the decision making process than the table hardware. So, while performance parity may be the longer term competitive dynamic in printer performance, the question remains, how will the range of value added services, like digital patterning software for example, factor into the offerings? Build it, buy it, or partner for it? Regardless of what the final offerings are, the bottom line is the workflow of tomorrow, the one that captures the customer, and the revenue with be: 3D CAD and digital design, digital patterning, and lastly digital printing. What are your thoughts? Do you see it the same way? To better support customers, new features, new services, and even consolidation is highly probable. It remains to be seen which companies, take what moves, and when, in order to win customers. 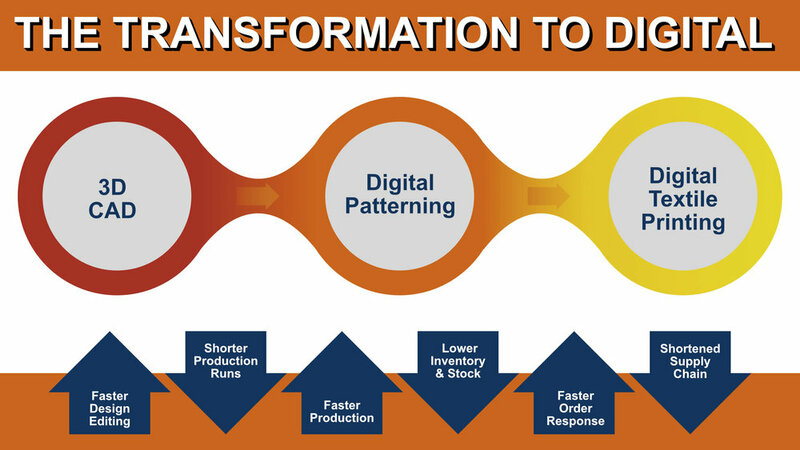 If you want to know more about Digital Patterning and how it supports the dye sublimation workflow for garments and apparel, click the link below and book time to talk to an expert.